This is the third book of poems in Garrett Kaoru Hongo’s long career as poet and teacher at the University of Oregon in Eugene, which includes a nomination for a Pulitzer Prize, editing an Asian American anthology, and penning his award winning Volcano: A Memoir of Hawai’i. His work has always been concerned with ancestry, and in Coral Road: Poems he weaves together a life tapestry, including family history, characters, and places. 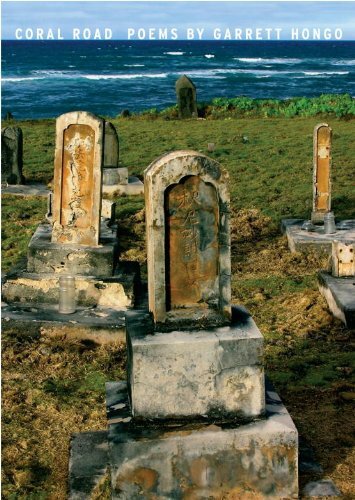 Deftly he discovers and traces patterns of ancestral immigration from Japan to Hawai’I, and survival in this new land, providing the book with brief genealogical charts and the striking and handsome cover photo of a family gravesite in Hawai’i. Though dealing with the past, the colors here are not dull, but strong, even bright with images of contemporary life, and the design is not dead and complete but still alive and growing. In these lines from “Waimea-of-the-Dead” we watch as Hongo entwines the lives of his teenage sons with his own memory as together they journey to Waimea to view the ceremonial dance for the dead. Pushing a grocery cart up the cereal aisles of a sad Safeway. Bobbed like glass floats along the intricate nets of electrical wire strung above me. the gentle web of pitches festival lights. These poems are moved along by feelings of nostalgia and insight, punctuated by such marvelous imagery as the bobbing lights and battered moth. Following the poetic Prologue, the book divides itself into five sections: Coral Road, The Wartime Letters of Hideo Kubota, The Art of Fresco, A Map of Kahukuku in Oregon, and Elegy. Because of the many geographic and historical references in the poems, Notes are provided at the back where they don’t interfere with the flow of the poems. Like a white mascara that melts invisible in an instant. Making a place on earth where the heart can be empty at last. This is deep music and clear, as the poet carries us to those places in the heart that ground and guide us. Coral Road: Poems by Garrett Kaoru Hongo is the strongest book of poems this reviewer has read in years.